In the Enabling Technologies Hotels (ETH) programme, life science researchers can apply for funding to get access to the high-end equipment and expertise of 130+ Technology Hotels that are listed on the DTL website. ZonMw has just announced which projects will be funded in the fourth call of the ETH programme. View the list of 60 awarded projects. Technology Hotels are expert groups that offer their high-end technologies and the associated expertise and infrastructure to researchers who do not have access to such facilities at their home institute. DTL’s searchable catalogue of Technology Hotels enables you to quickly locate an expert group. ZonMw and NWO have set up the ETH programme in collaboration with DTL to stimulate open access of Dutch research facilities. The programme contributes to the aims of the Topsectors Life Sciences & Health, Agri & Food, and Horticulture & Starting Materials. The latest (fourth) call closed on 29 August 2017. The fourth call was open to public-private projects (PPP), i.e., collaborations between academic and industrial scientists. Projects in this category were asked to include the company as co-applicant. The main applicant was a scientist at a Dutch academic research organisation. It was also possible to submit an application without a company as co-applicant in so-called ‘early career scientist projects’ (ECS). Here, the main applicant had to be a scientist at a Dutch academic research organisation who obtained a PhD in the period 2009-present. It was not necessary to involve a company as co-applicant in these project proposals. ZonMw received a total of 164 project proposals, 87 of which were ECS projects and 77 were PPP projects. In each category, 30 projects were awarded (i.e., the success rate was 34% for ECS and 39% for PPP). The funded projects will run for a one-year period and they will receive a maximum of EUR 30,000 funding. 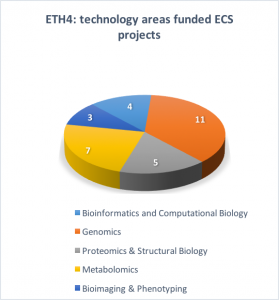 The ETH programme is active in several technology areas: bioinformatics & computational biology, genomics, proteomics & structural biology, metabolomics, and bio-imaging & phenotyping. 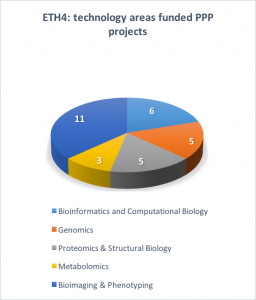 The charts below show the distribution of awarded projects over these areas. This entry was posted in General, Technologies.